This just in from the ‘You couldn’t make it up’ department. Top local history ferret [Howmuch?] spotted this article in the archive of The Walsall Observer, from the issue of Friday, 3rd January 1958. Charles Ferrie was the father of Ralph, whom I believe took on his father’s business, as described by reader and friend of the blog, Godfrey Hucker, in a previous post. Sadly, the article wasn’t in an easily transposable format, so I’ve transcribed it below. It would be very easy to mock this – but in the grip of the cold war, the space race and media paranoia was very real at the time. I guess the two companies Charles alluded to would have been McKechnie and Kynochs, which latterly became IMI. Both were specialist metal processors; the former copper and it’s alloys, mainly brass, the latter, titanium. From the Walsall Observer, 3rd January, 1958. In a workshop less than 30 yards from High Street, Brownhills, physicists and students of chemistry from the universities of Bristol and Sheffield are completing plans for the making of a model combustion engine, which, it is hoped, will help them develop a rocket which would take a missile into outer space. The scientific team now officially known as the Space Research Group came about as the result of an offer, by Mr. Charles Ferrie, the Brownhills industrialist and racehorse owner, of manufacturing facilities for students interested in outer space research. Fourteen students have been selected to take advantage of the facilities offered. Apart from work on the model combustion engine, experiments will soon be made on fuel injection systems, radar tracking apparatus and outer casings for the proposed missile. Two big industrialist concerns, one in Aldridge and one in Birmingham, are co-operating with Mr. Ferrie and are supplying special metals and drawings to the students free of charge. The ‘Observer’ understands that Mr. Barnes Wallis, the renowned scientist who perfected the bomb used by the ‘Dam Buster,’ will soon be approached for his observations on the project at Brownhills. Mr. Ferrie is himself negotiating for the lease of 400 acres on Salisbury Plain, where static rocket engines may be tested. Many of the students have degrees, in chemistry and physics and are studying for their Ph.D. degree, while others are last-year students, and all intend taking up rocket research as a career. One girl is a medical student and is interested in space medicine. 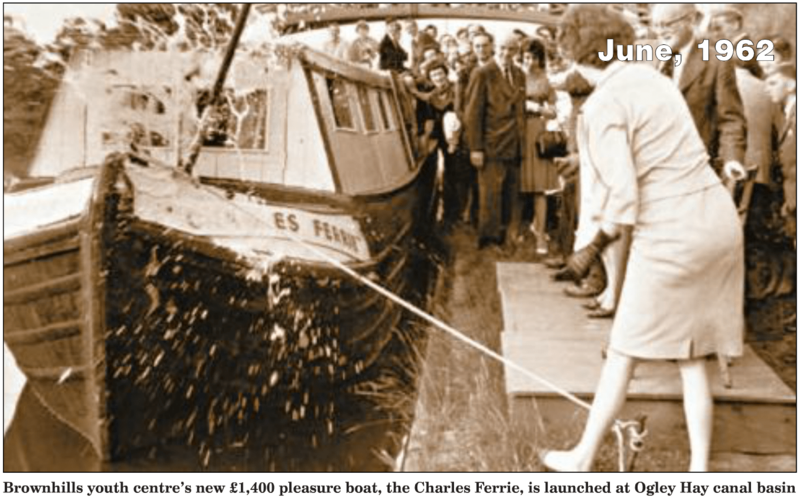 I’m not sure when Charles Ferrie passed on, but this boat was certainly named after him in 1962. Image from the Walsall Chronicle. This entry was posted in Bad Science, Brownhills stuff, Environment, Events, Followups, Fun stuff to see and do, Interesting photos, Just plain daft, Local History, Local media, News, Reader enquiries, Shared media, Shared memories, Spotted whilst browsing the web, Walsall Wood stuff and tagged 1958, Bristol, Charles, Ferrie, Howmuch, ICI McKechnie, IMI, Kynoch, Ph.D, physicist, Ralph, rocket, rocket science, Shelfield, Space Reasearch Group, Sputnik, University, Walsall Observer. Bookmark the permalink. 17 Responses to Build a rocket, boys! Never knew Brownhills had entered the space race. Charles H R Ferrie 1923-1982. Judging by the bridge at the top of the picture the boat was moored just east of Pier Street (rather than in the basin)? Cheers, Andy, good to see you. Thanks for that, it’s cleared a few things up for me. So poor old Charles must have passed away the year the article was written. How sad. Pier Street Bridge was flat, IIRC, not curved. I think that’s Ogley Junction Bridge, near the old Superalloys. I don’t know much about the history of the boatyard there (referred to as ‘The Long Pound’), so it may well be worth exploring at some point. Yes, I realise my folly! Hey, it was a reasonable assumption! If I remember correctly, Ralph paid to have the boat made in memory of his father, Charlie, and it was presented to the local youth club (poss Brownhills?) for their use on the local canals. Don’t know what became of it after the launch though. Continuing the family tree thread: I missed Ernest Ralph Ferrie 1919-1988, son of Charles H. Must be the Ralph in tone’s reply. Ernest Ralph Ferrie was Ralph’s cousin, kept The Hop Pole pub in Stafford for many years. The Ralph I’m referring to is Charles Henry Ralph Ferrie (1923 to 1982), he was always known as Ralph to help stop any confusion with Charles Ferrie, his father. Hi ,I’m the granddaughter of Charles Henry Ralph ferrie ( Ralph ) . My mother is his eldest daughter Ellen . Cracking story this. It would be amazing if you had some memorabilia referring to your Granddad and his amazing life Lisa? I’m. The daughter of Ernest Ralph Ferrie who kept the Hop Pole in Stafford. I remember Ralph and Amy well and the Rolls Royce they had..
Hi there! I’m the great-granddaughter of Ernie Ferrie Sr. (Charlie Ferrie’s brother). I will let you know if, when going through old family memorabilia, I come across anything related to Charlie/Ralph. Hey, thanks – that would be wonderful!